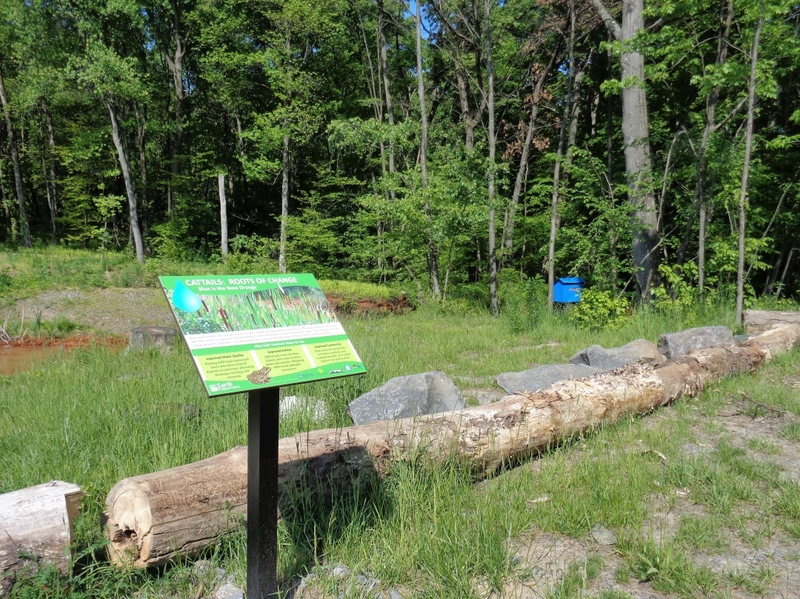 View of the wayside exhibit’s welcome sign and walking trail, from the Askam parking lot off of Dundee Road. 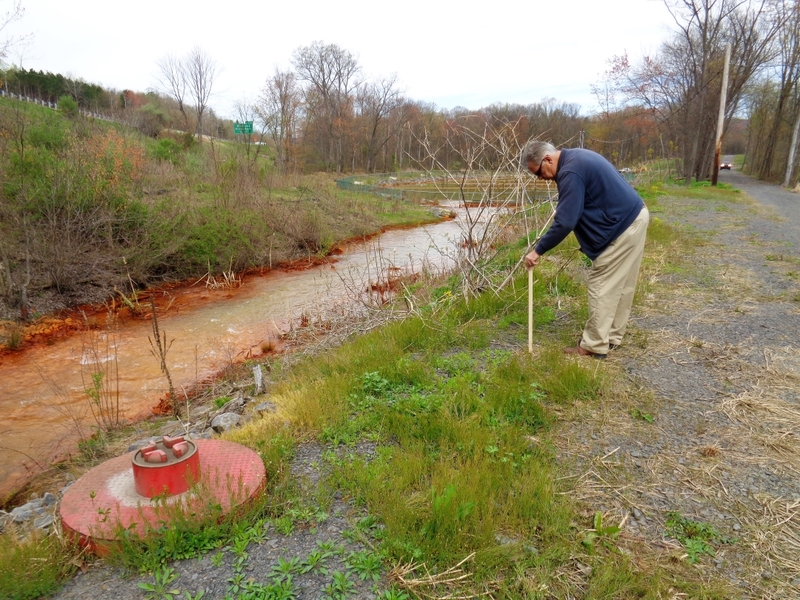 Although the Askam Borehole relieves water pressure in underground mines, it also releases acid mine drainage (AMD) into the Nanticoke Creek, polluting its waters and the watershed. 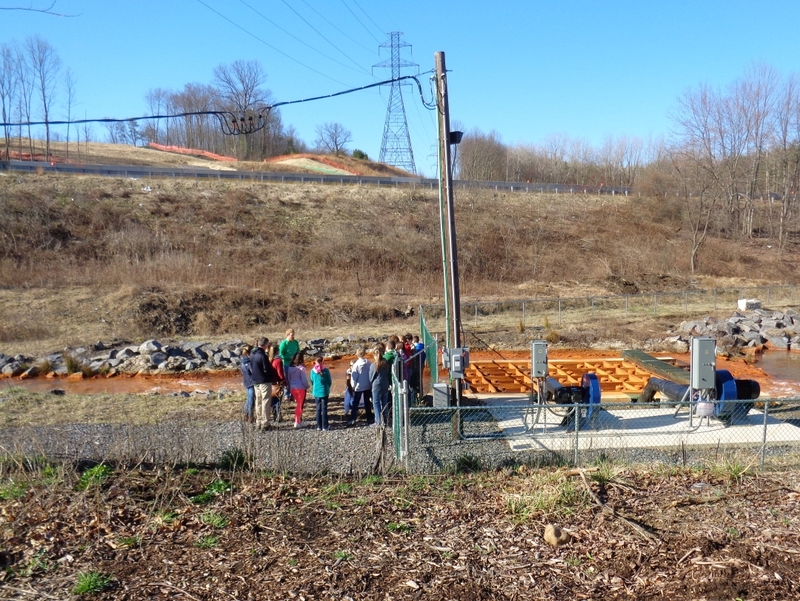 In 2014, Earth Conservancy (EC) constructed an oxidizer-based AMD treatment system to mitigate AMD effects. 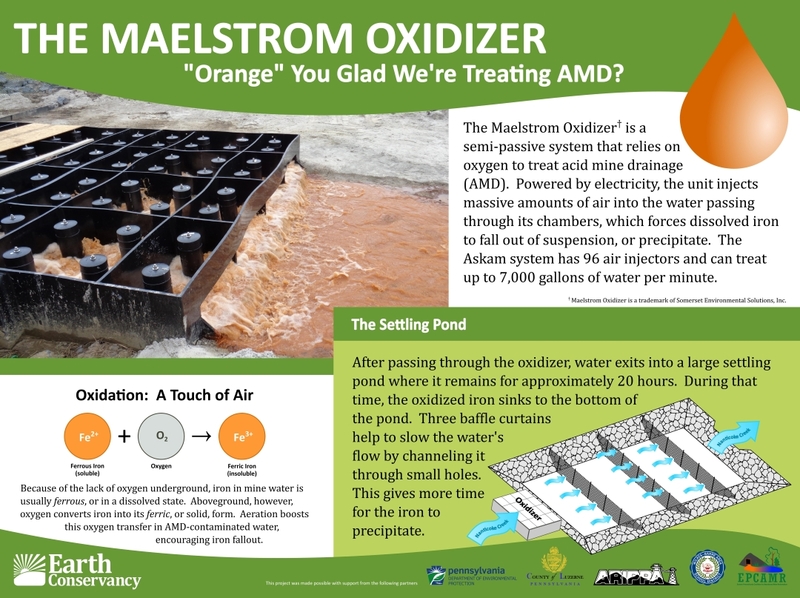 Since the oxidizer’s installation, however, EC has repeatedly fielded questions about the large orange pond off of SR 29, especially in regard to its environmental impacts. 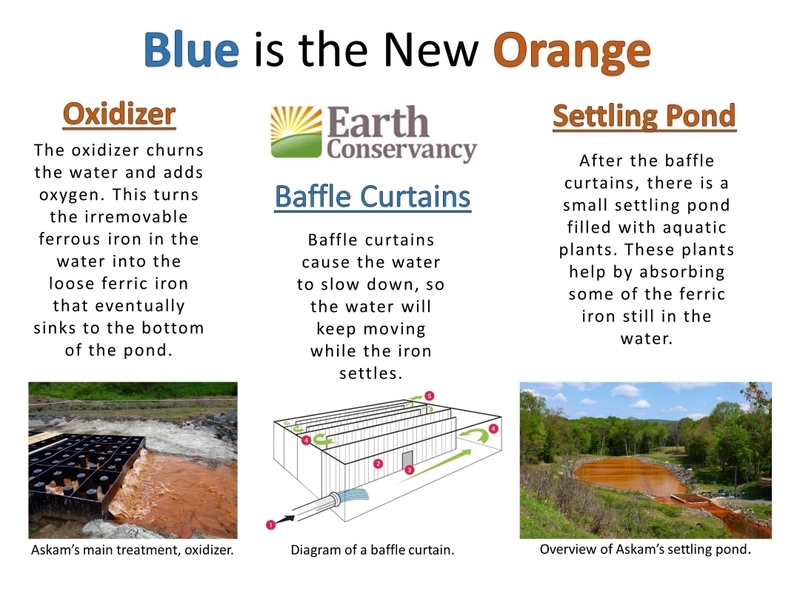 In truth, the orange color indicates the pond is working, preventing AMD from flowing into the Nanticoke Creek. Communicating this to the public, however, proved difficult. Moreover, the Askam system uses an innovative AMD-treatment technology. Construction involved numerous federal and state partners, and cost approximately $1 million. It is a notable achievement in EC’s history. We wanted people to understand the history of the project, the mechanics of the system, and the importance of watershed protection. To solve this problem, EC decided to invite the public in, establishing a wayside exhibit and walking trail at the Askam site. 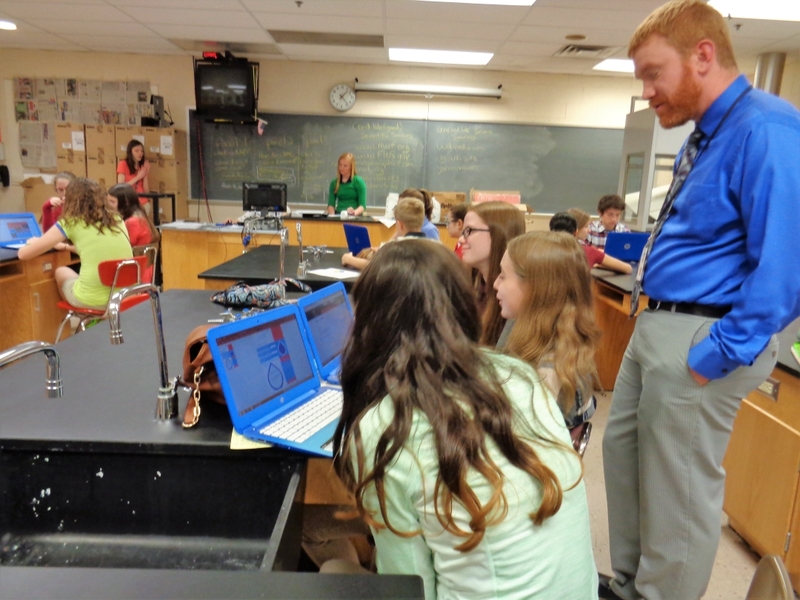 Working with students from the Wilkes-Barre Area School District, EC oversaw the signs’ design. Fossil Industries then fabricated the four panels on high-pressure laminate. 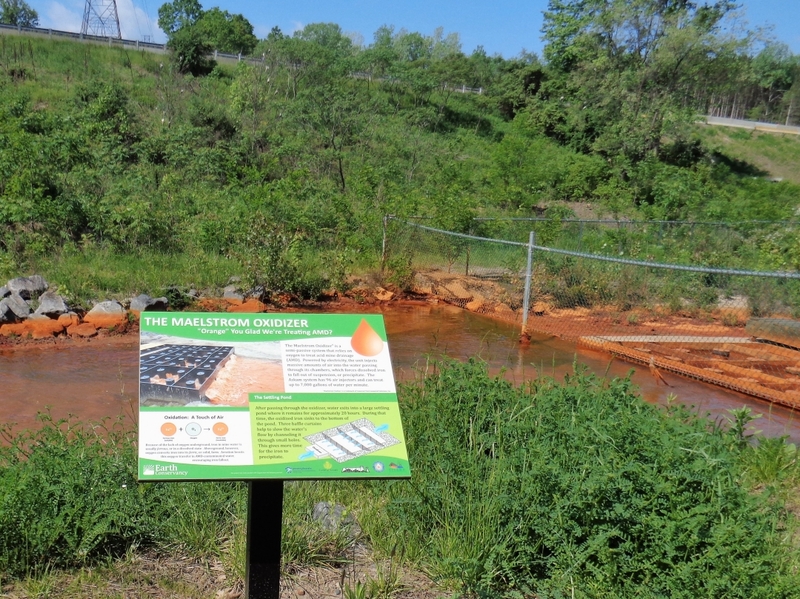 Now installed, the signs are helping to educate the community about local efforts to improve damage from pre-regulatory mining in the region. 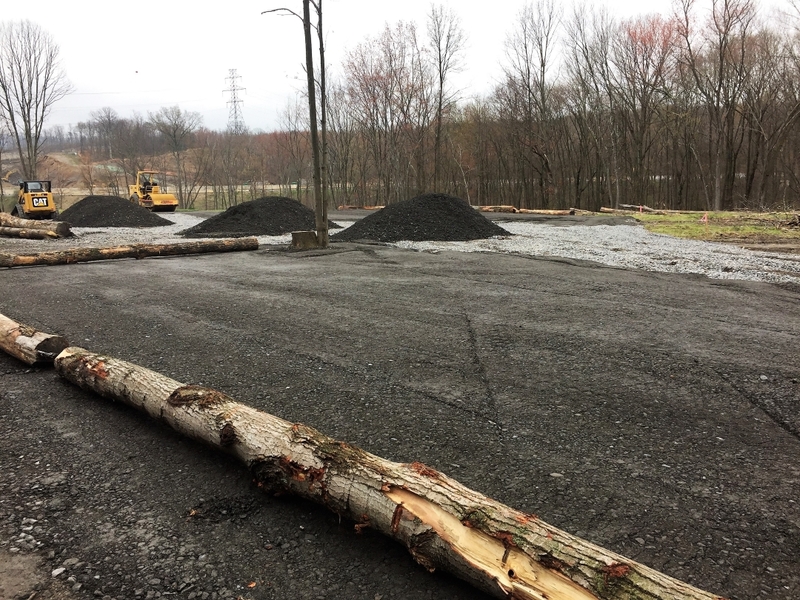 Our thanks to our partners at WBASD and EPCAMR and the generous support from the Pennsylvania Department of Environmental Protection, Luzerne County, and ARIPPA. 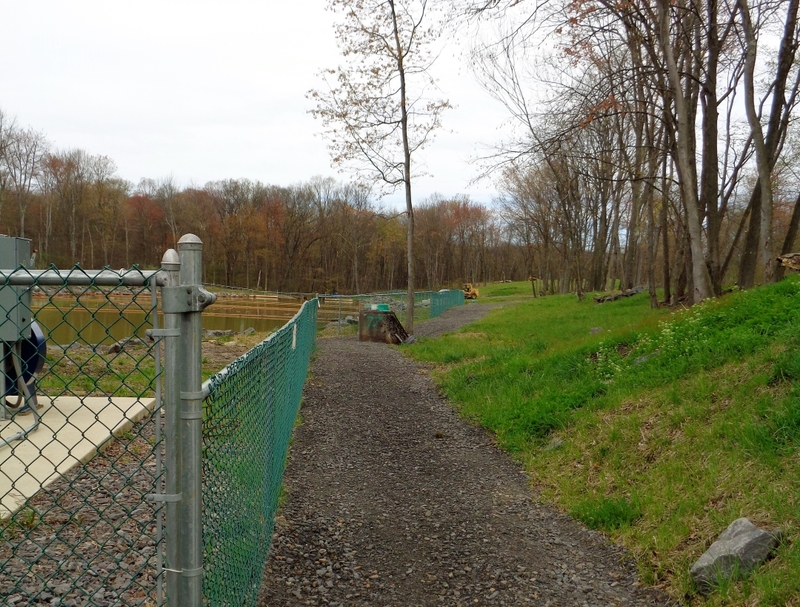 The Askam Borehole AMD Treatment System Wayside Exhibit is located off of Dundee Road in Hanover Township and is open to pedestrian traffic during daylight hours. For more information, please call EC’s offices at 570.823.3445. EC began the Askam Wayside project by inviting students from Solomon Plains Jr. High School to visit the Askam site. There, our partner EPCAMR, discussed the differences in passive versus active AMD treatment systems, and exactly how Askam’s oxidizer system worked. The 7th and 8th grade students were broken into groups, each responsible for designing a specific sign at the Askam exhibit, under the direction of their teachers, Jared Meehan (pictured here) and Meredith Falcheck. 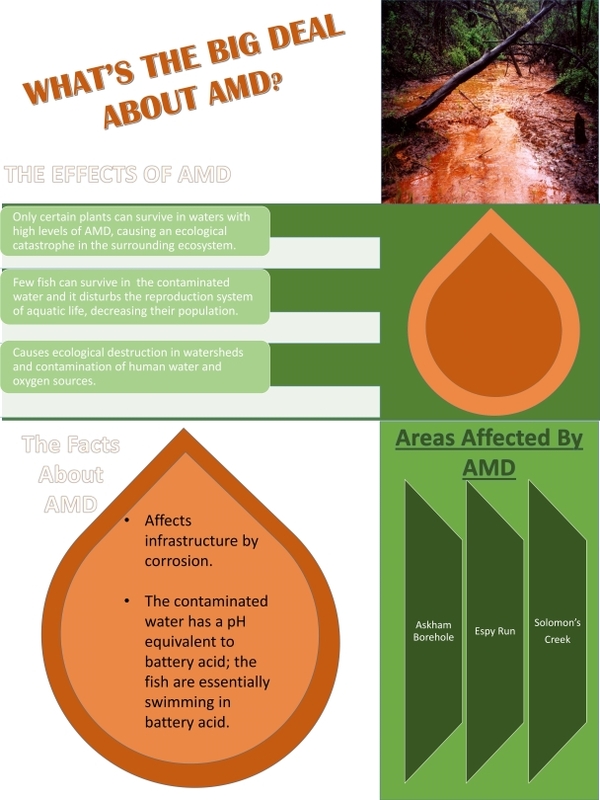 One of the completed student signs, discussing the problems of AMD. Another example of the students’ signs, this one providing an overview of the Askam treatment system. EC then took the students’ ideas for the interpretive signs and had them professionally reinterpreted. Designs were sent to Fossil Industries for printing on high-pressure laminate. Meanwhile, EC used additional grant funds to construct a walking path along the Askam system, beginning at the boreholes and ending at the polishing cell. Also added was a parking lot to accommodate buses when visiting. 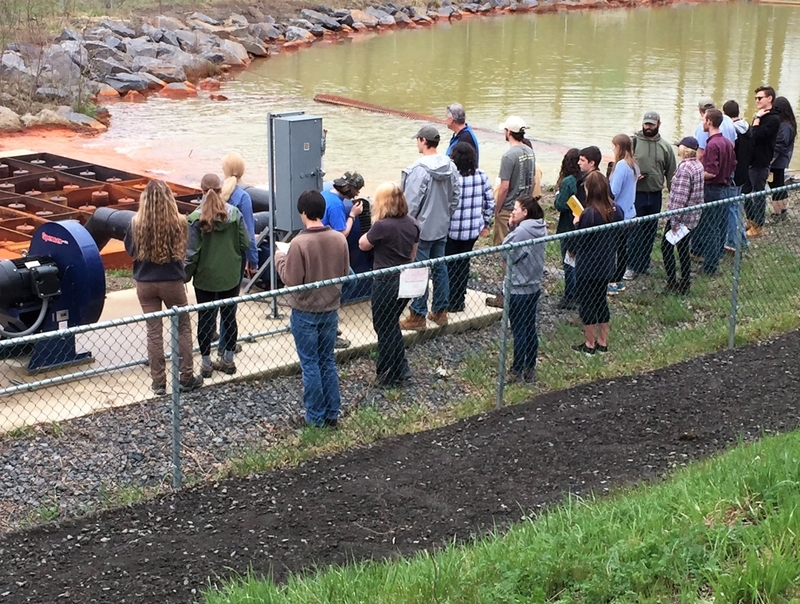 Approximately 2,000 individuals visit the Askam site annually through tours given by EPCAMR. View of walking trail along settling pond. EC Site Supervisor, Richard Ruggiero, marks location for interpretive sign installation. 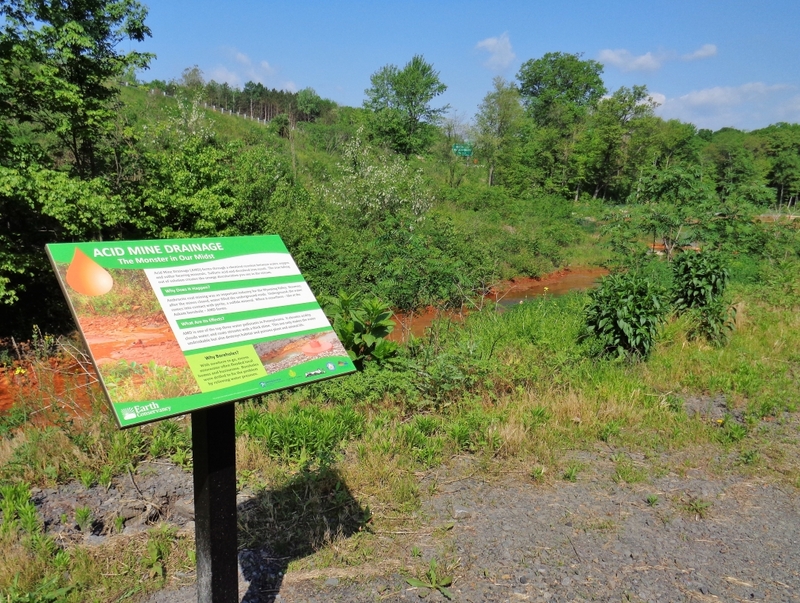 First interpretive sign, adjacent to one of the Askam boreholes. Second interpretive sign, next to the Maelstrom Oxidizer. Third interpretive sign, at the outlet of the settling pond/polishing cell. 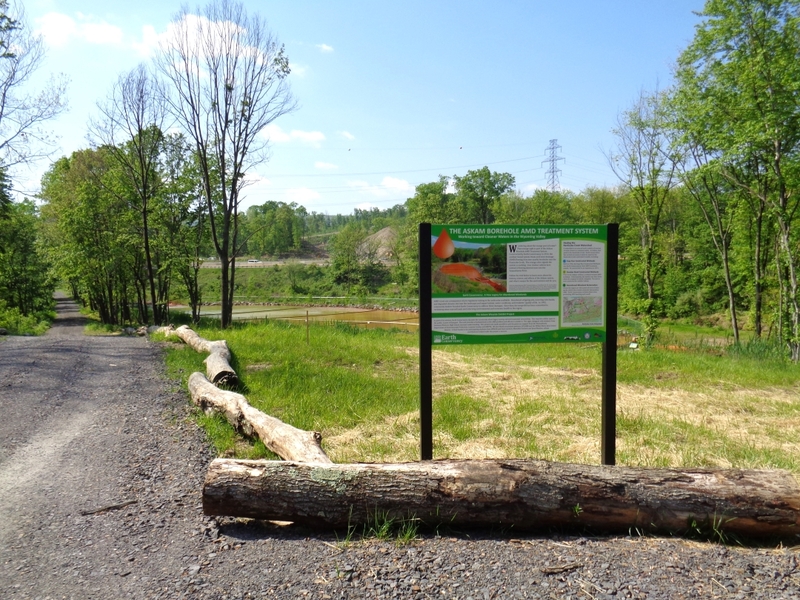 Now open to the public, the wayside trail offers individuals and groups an opportunity for learning more about AMD, the Askam system, and watershed protection. Pictured is a group of students visiting in April 2017 from Hartwick College in New York.